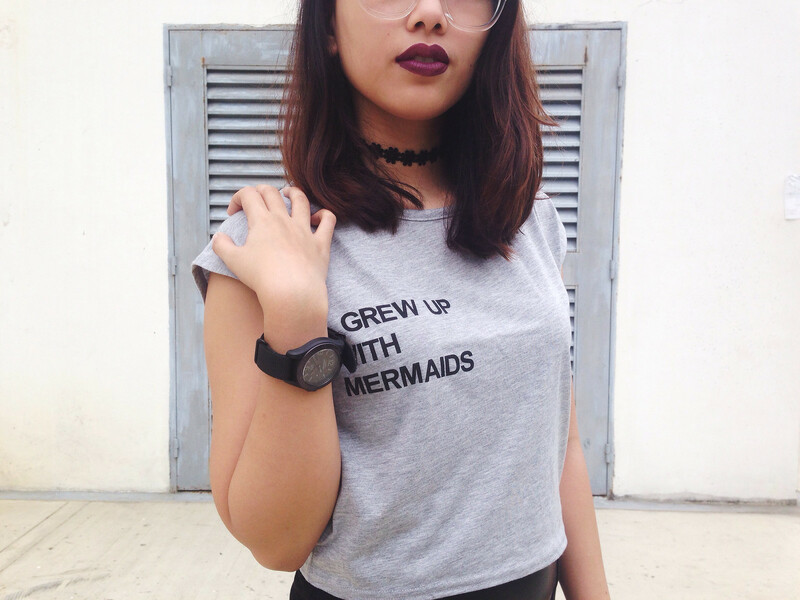 Usually, when someone thinks of mermaids, they're incorporated with dreamy hues and hologramic pastels. When I saw this ironic gray top in H&M, I wondered why they have made it monochrome. After not much of a thought, I decided to buy it. 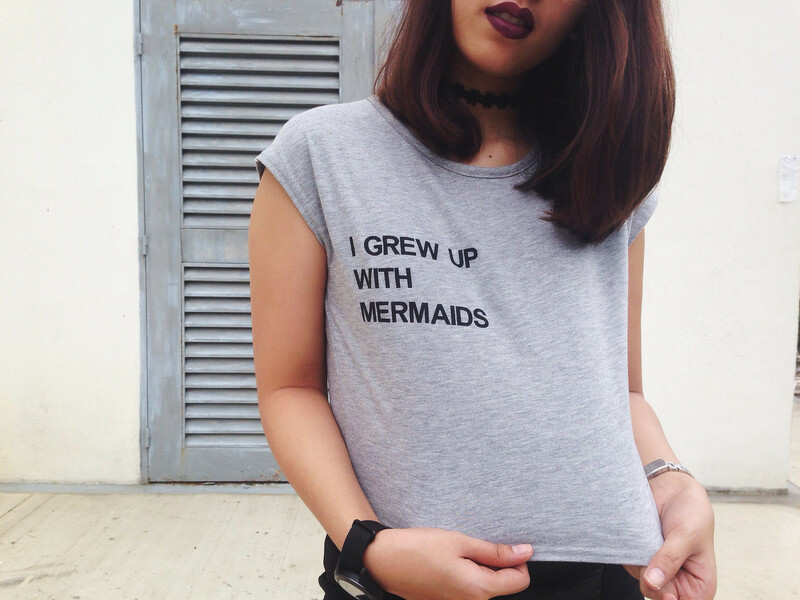 "I GREW UP WITH MERMAIDS" was just begging to be taken home by Momma. Since 2013, I skipped wearing those loud graphic shirts and gave them away. I think that was the time when my taste and vision for my style matured. I started trying different clothing combinations like bold colors and prints. Since then, I noticed that I was spending more time and effort when buying apparel. Although, my budget was limited because I was still in college back then. The reason I still take a lot of time while I shop is because I still look at the price tag, and this is why I always shop a lot when I'm at H&M! Their clothes are incredibly affordable and very trendy. There are just too much to choose from. I apologize for wearing two different watches, I changed my mind in the middle of this short shoot. LOL! How about you, do you like wearing graphic tees? 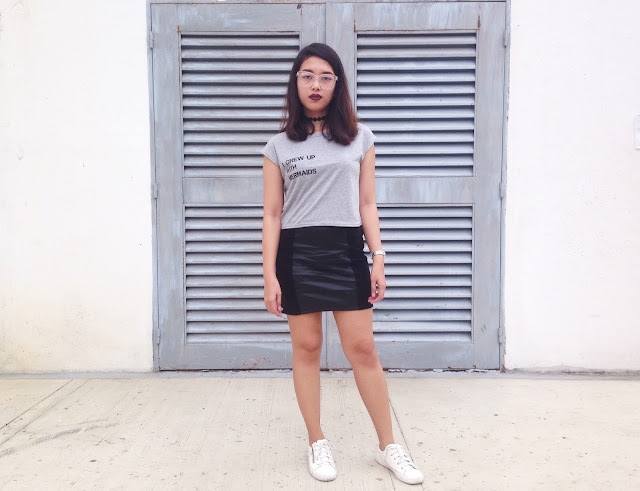 I think graphic tees would never go out of style naman beacuse they seem to adapt with the trend nowadays + it looks good if you pair it perfectly with other pieces (just like what you did). Just recently, I can't help but grab the shirt from Cotton On which says "Los Anjealous" bc come on, it's just too cute. Haha! You look amazing. Great neutral look. That t-shirt is so cute and you look very chic in this casual style. I myself do not wear large graphic tees either, but I do love a good minimalistic shirt with a phrase and this one is no exception. I have one that I just bought myself that says "I'de rather be watching cats on the internet." haha. So so lovely babe, I love it. You did right to buy the shirt as it is a cool piece and it shows the essential word "Mermaid" :) I'm impressed how conscious you are with your money - kudos to your dad and how you teached you! I like you in this rock chic look! 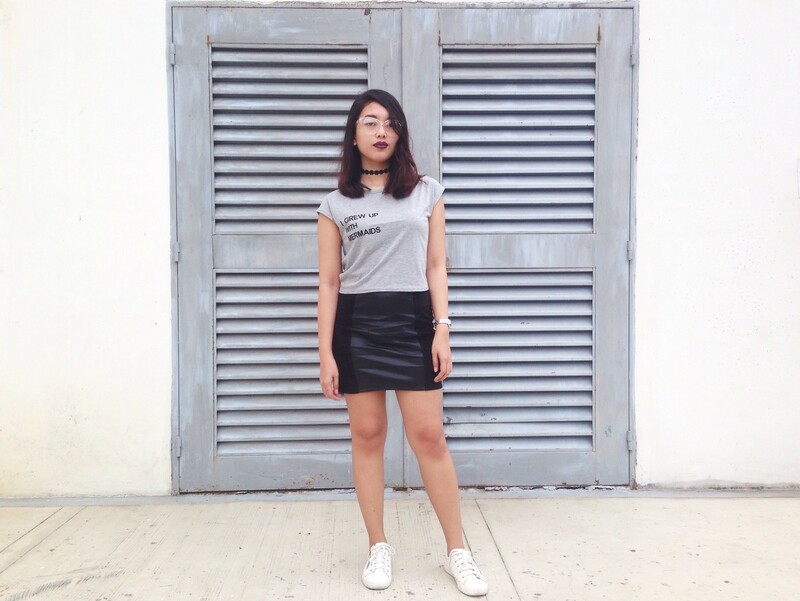 I hated graphic tee for years but ever since it made a huge comeback the past two years, I'm really loving it! You actually pull off this tee really well!